Places to stay with the Poldark-factor! Since the first publication of Winston Graham’s Poldark novels the stories and characters have become synonymous with the drama and romanticism of the coast of Cornwall, it's mining heritage, great fortunes and struggles against a backdrop of diverse sea states and the hardships of living in remote, rural Georgian Britain. The new BBC production of Poldark, adapted and made real by Mammoth Screen Productions, has just finished its fourth season on UK tv. Visitors from the UK and overseas can now gain a flavour of what it was like to live in the Cornwall of the late eighteenth and early nineteenth centuries and “live the dream”with the modern day comforts of the top UK holiday destination. Our interactive map shows all the locations used for filming; starring Aidan Turner and Eleanor Tomlinson in the roles of Ross and Demelza, as well as some notable locations from which Winston Graham drew both his inspiration and historical accuracy. Most of the locations have either public access or may be accessed by private arrangement. One, Two and Three Day Poldark tours to learn about Poldark’s life, loves and including some of Cornwall’s hidden treasures may be booked easily. Although many of the beaches and coves can be accessed by car, some require a good degree of stamina and mobility to walk the necessary distance from a nearby car park. 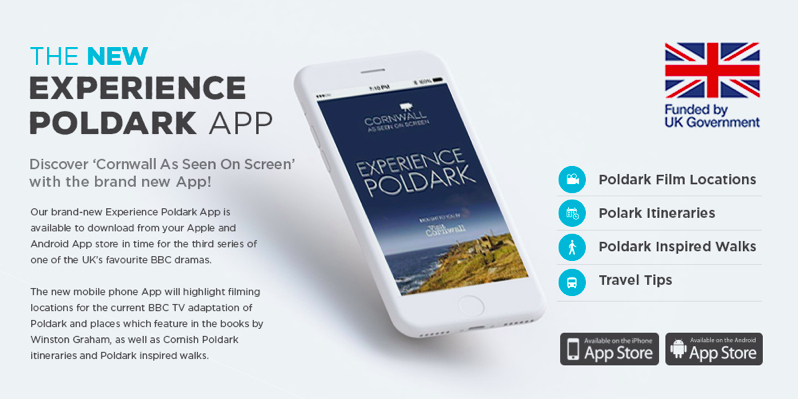 Discover 'Cornwall as seen on screen' with the brand new 'Experience Poldark' App. The new App provides Poldark lovers with the tools to explore Cornwall. The App promotes Cornish film locations, Poldark itineraries, Poldark inspired walks as well as providing some fun facts and a Poldark lingo decoder. Just visit your Android or Apple store and search for Experience Poldark.